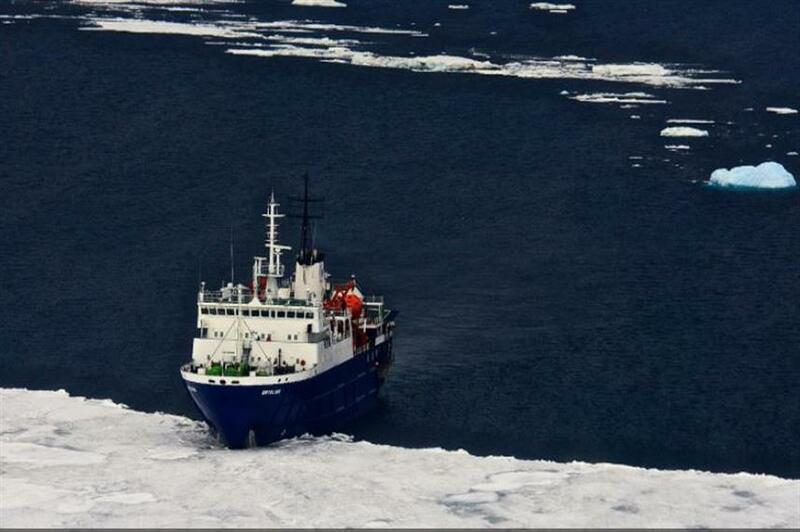 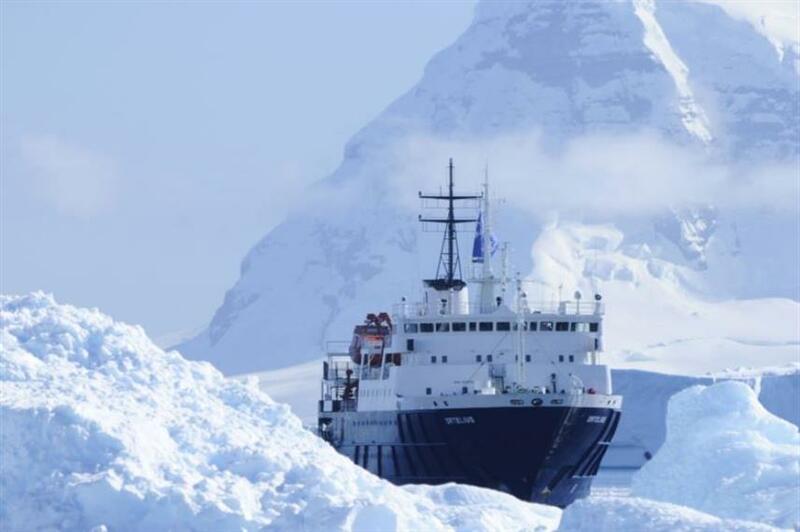 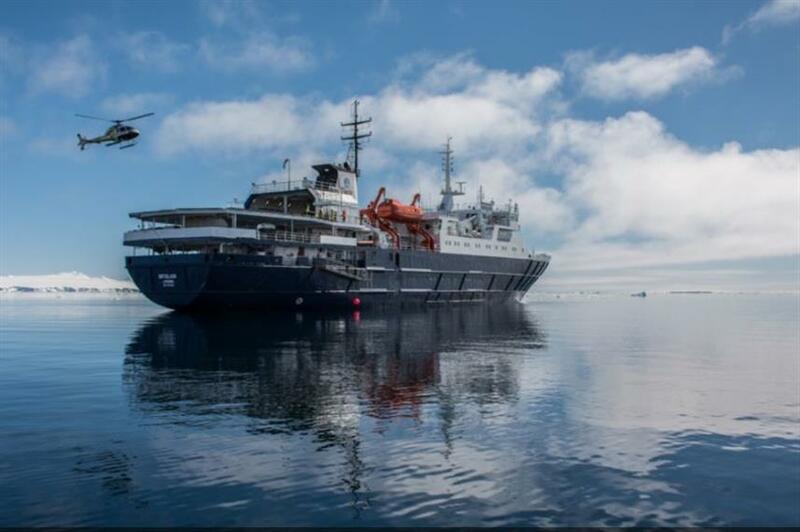 Originally a special purpose vessel for the Russian Academy of Science, the 91m Ortelius now offers exciting expeditions in the Arctic from May - September each year. 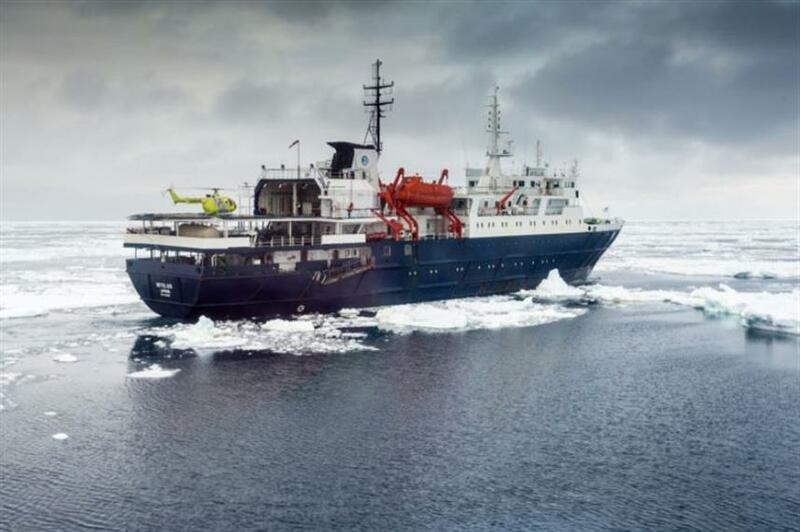 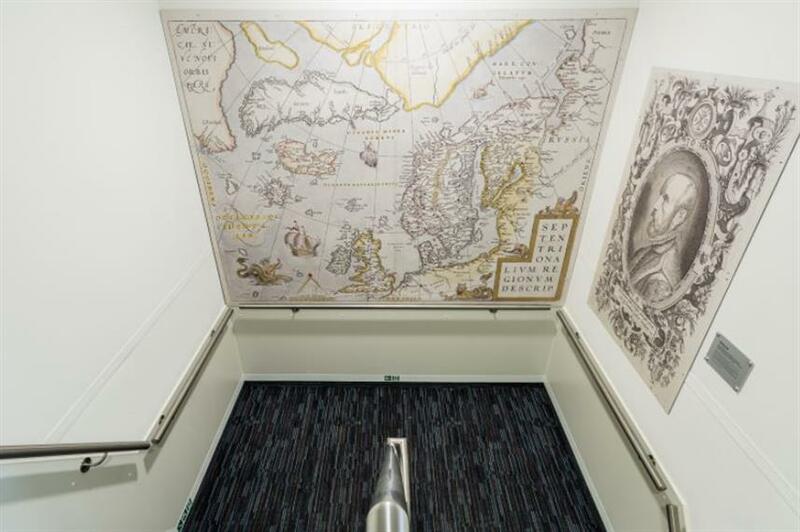 The Ortelius is an ice-strengthened vessel, and actually has the highest ice-class notation available, making her more than adequate for these exciting voyages. 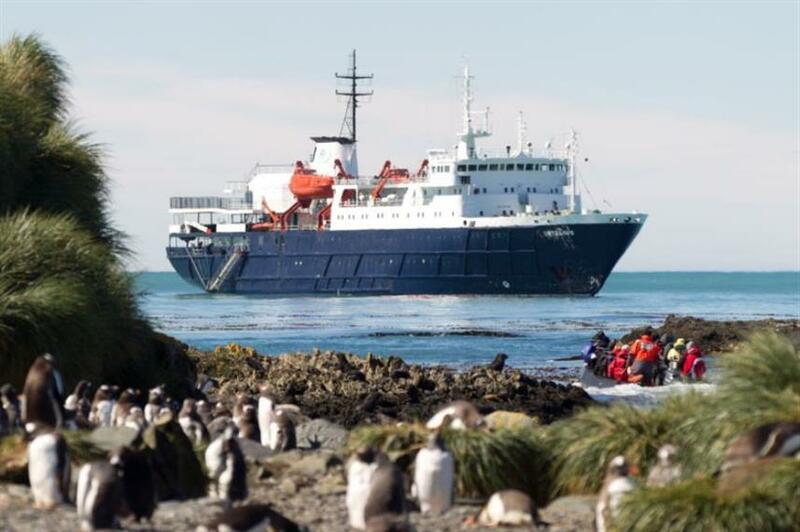 A highly experienced crew of 22, including 8 expedition staff, are on-hand to look after guests needs. 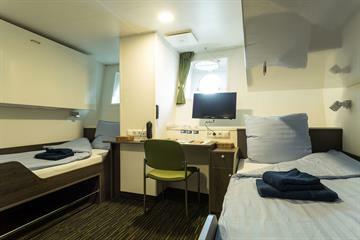 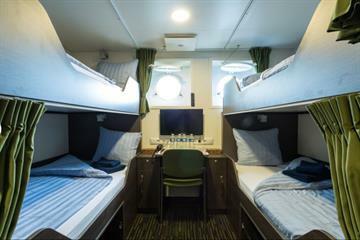 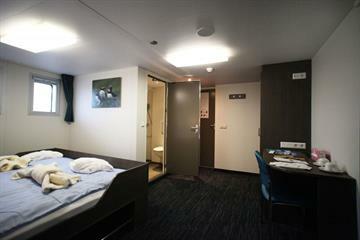 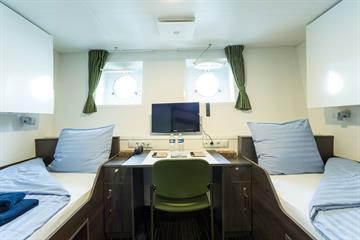 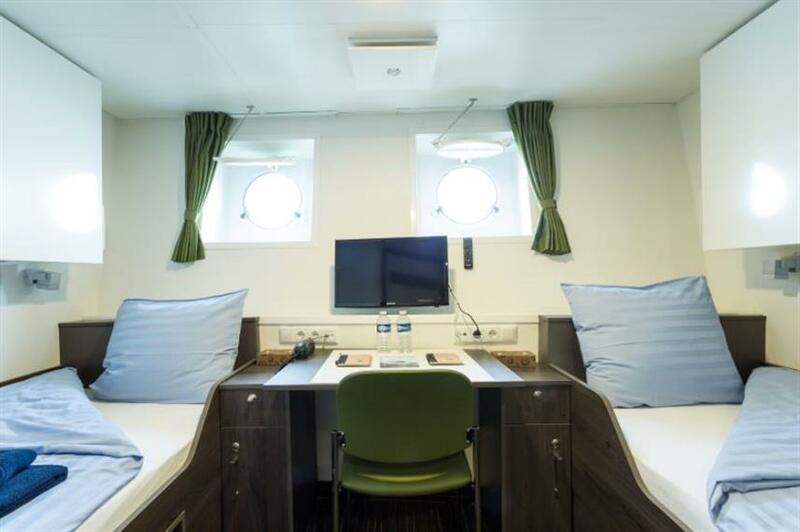 The Ortelius caters to 116 guests in 48 simple, yet comfortable en-suite cabins. 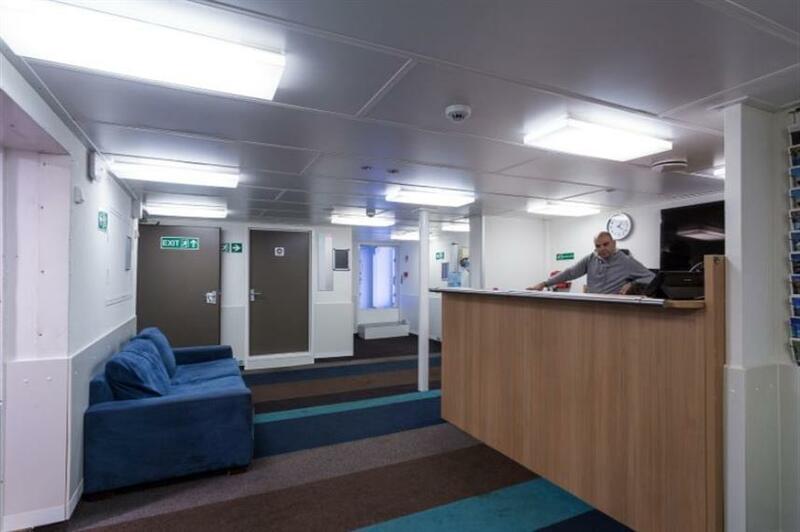 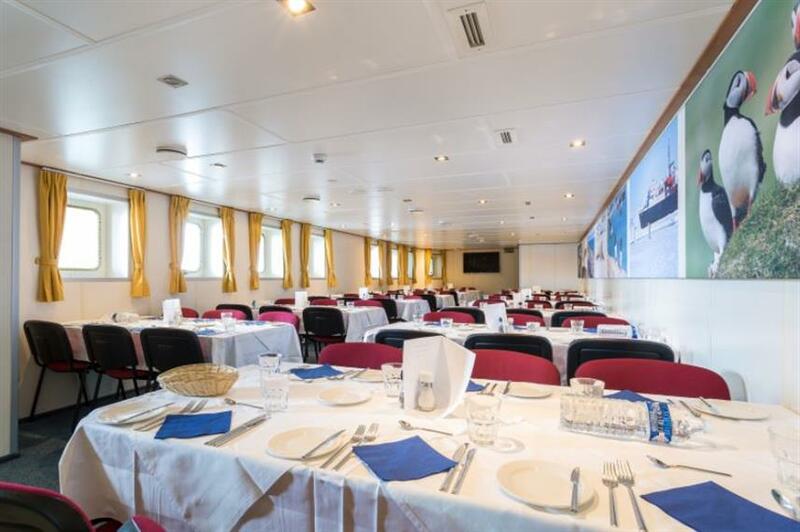 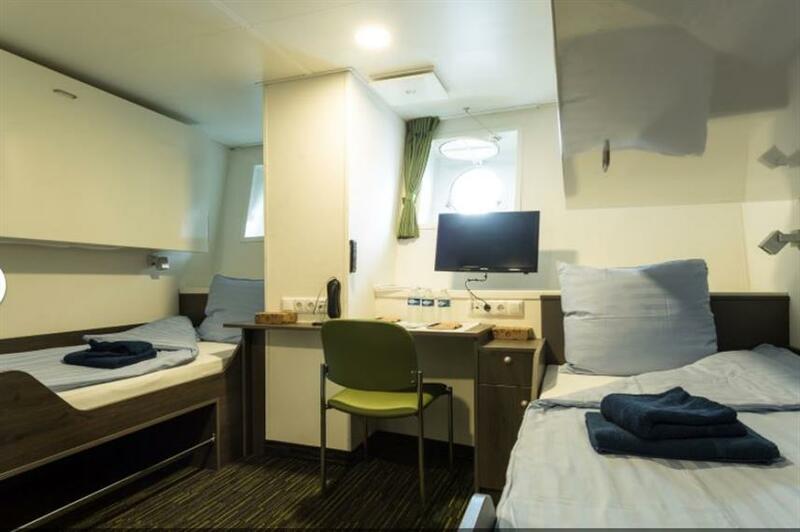 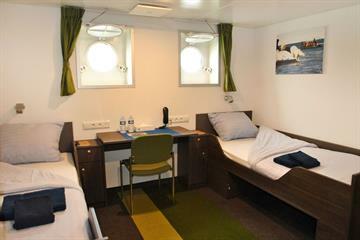 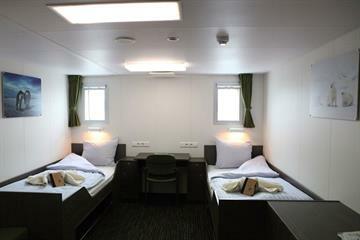 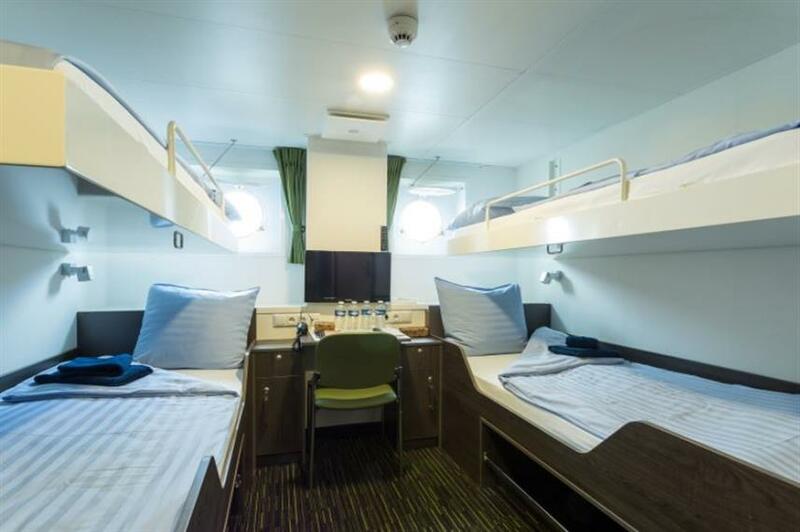 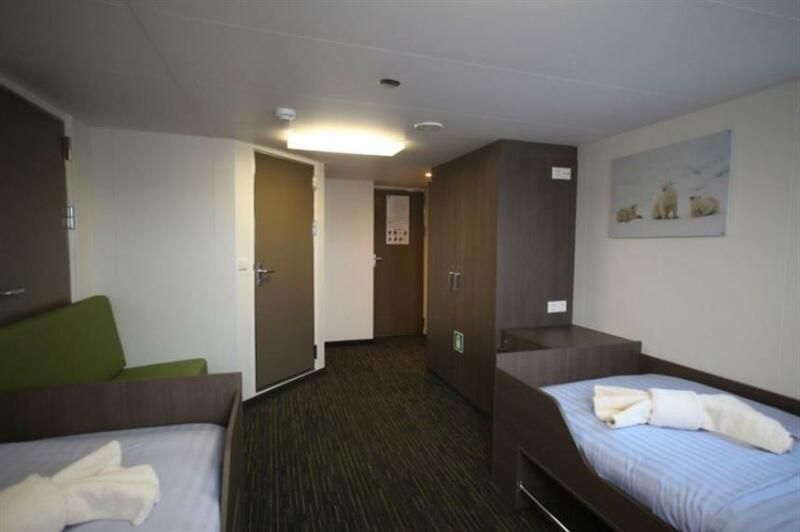 Cabins are available in a range of configurations, including twin, triple and quadruple. 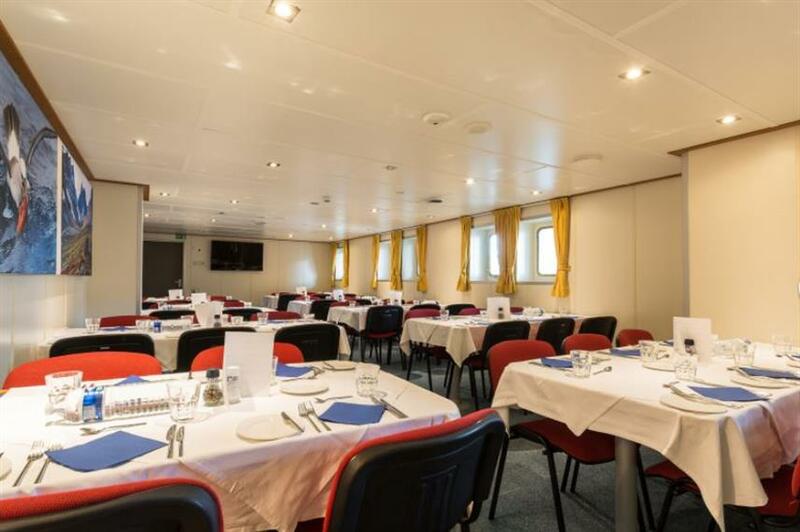 Social areas include two restaurants, bar/lecture room and observation lounge. 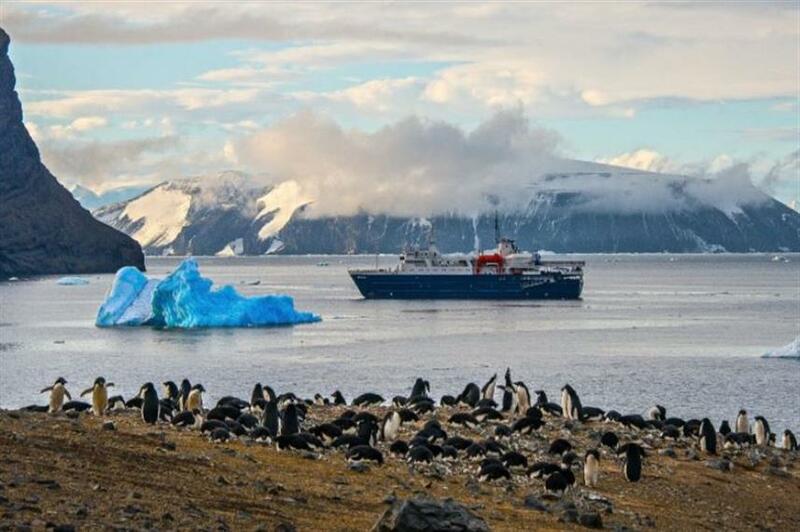 Voyages aboard the Ortelius have been designed to offer guests as much time ashore as possible with a quality wildlife program on offer. 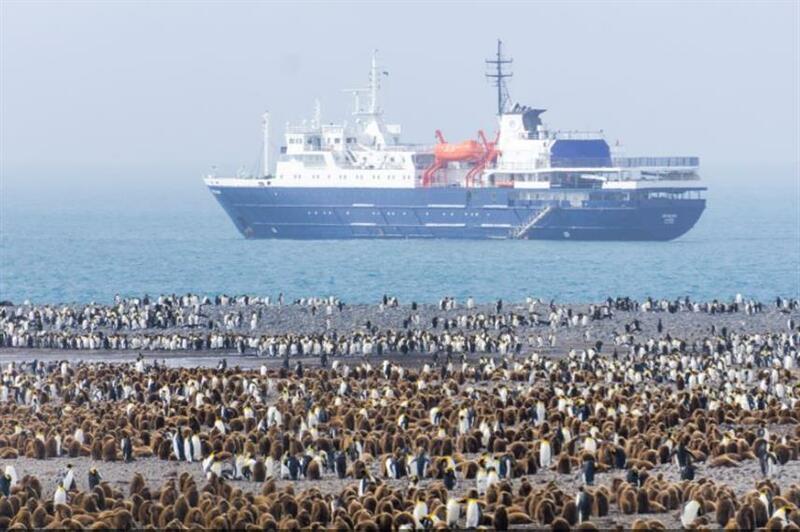 Itineraries range from 8-15 days, and include looking for Reindeer around Spitsbergen, humpback whale watching, seeing Arctic fox & Polar bears, as well as special Polar bear trips dedicated to finding these amazing animals. 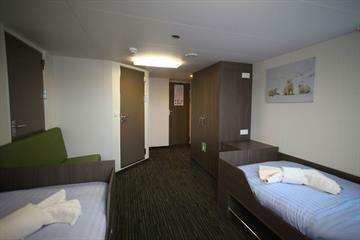 Activities include hiking, kayaking and snowshoeing. 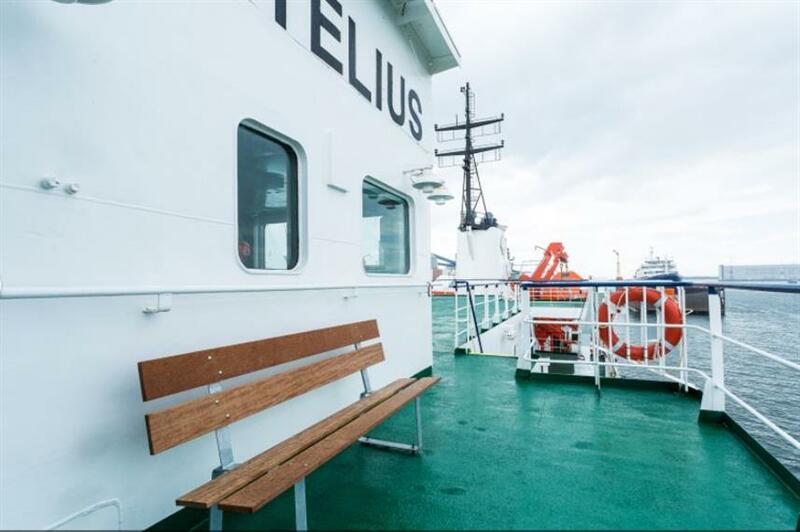 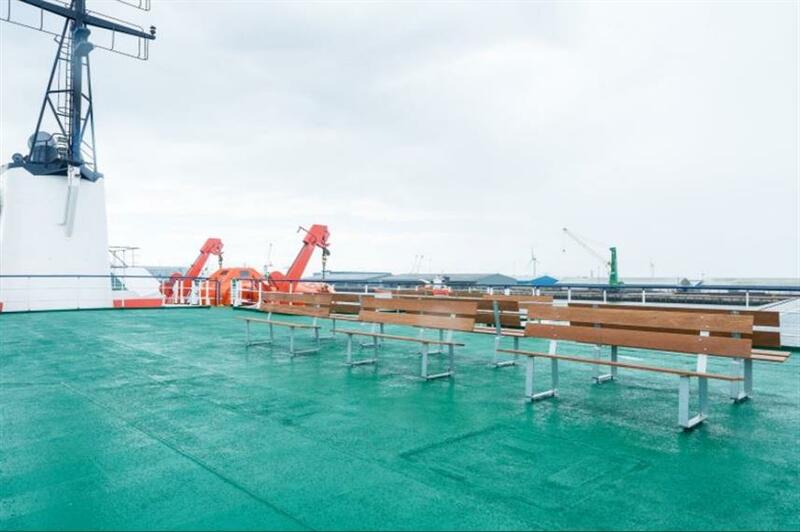 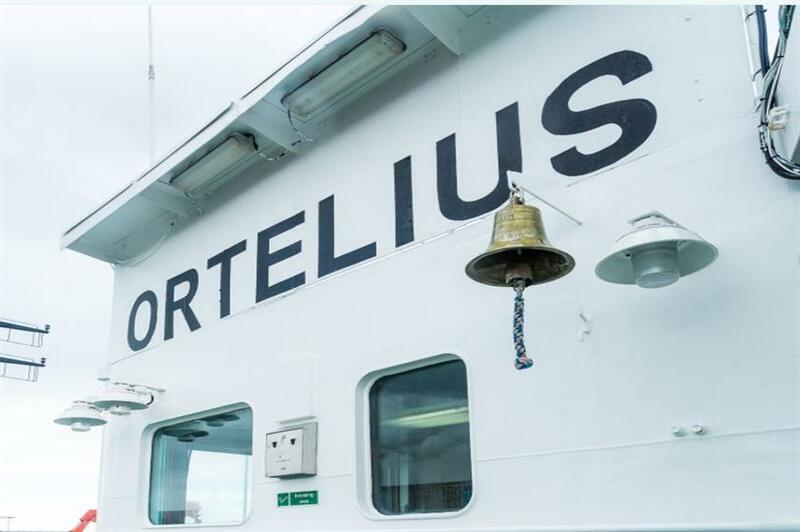 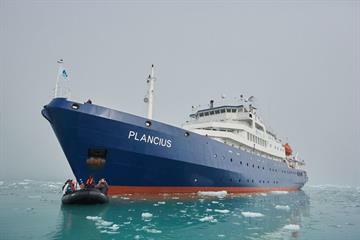 Ortelius explores the Arctic region between May to September. 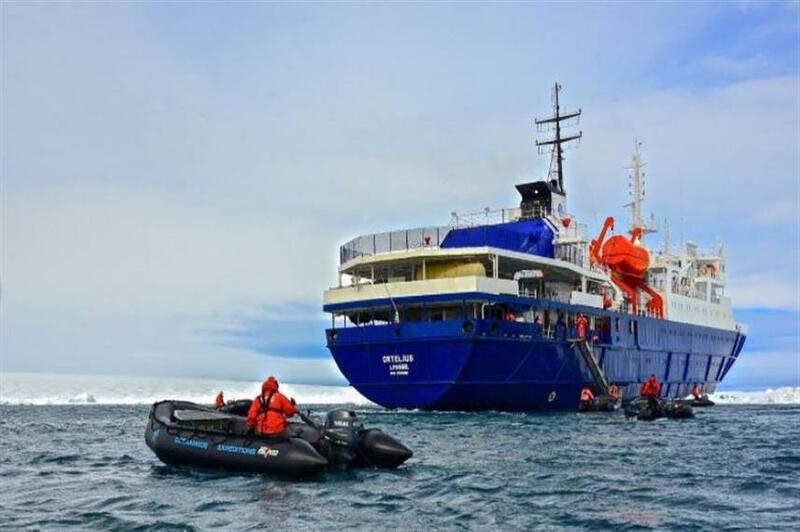 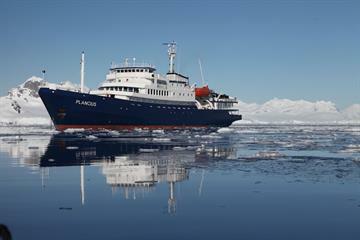 Arctic dive trips visit North Spitsbergen, and dives vary from shore diving, zodiac diving and wreck dives. 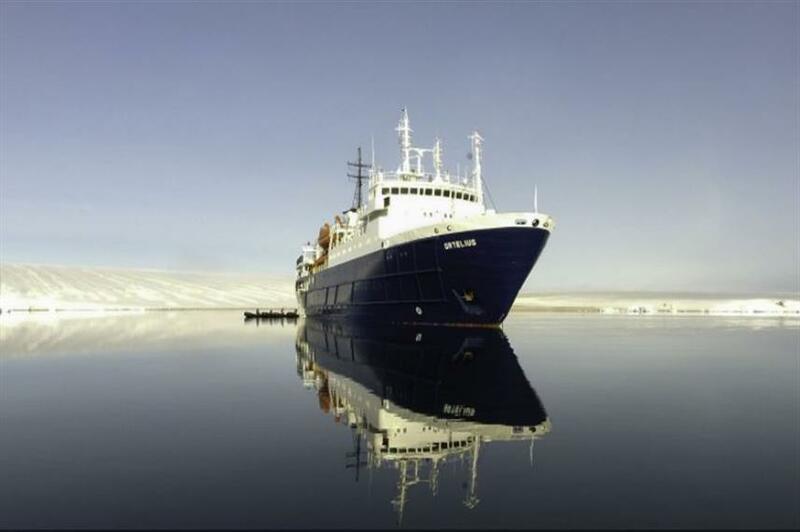 Diving is quite shallow (30 - 60 feet), but divers will have the fantastic opportunity to dive next to or under ice floes. 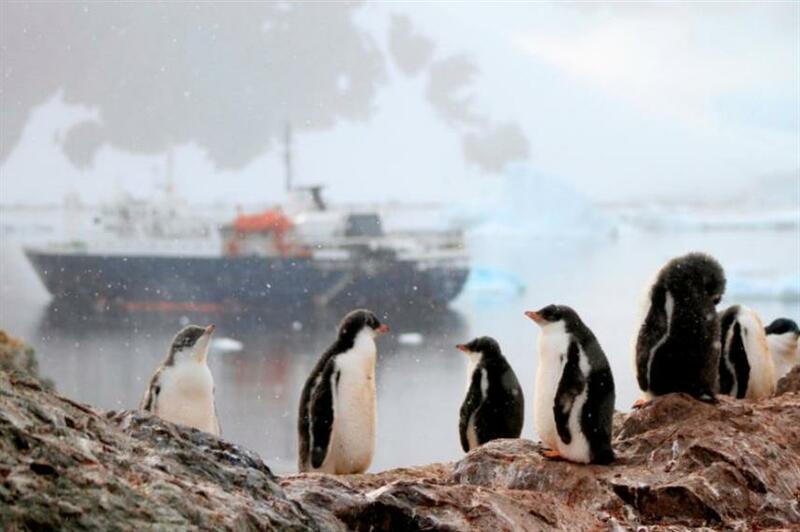 Not only will divers marvel at the ever changing colours underwater due to the combination of sunlight, seawater and amazing ice formations, but will also see kelp walls, lobster, crab and sea hedgehogs. 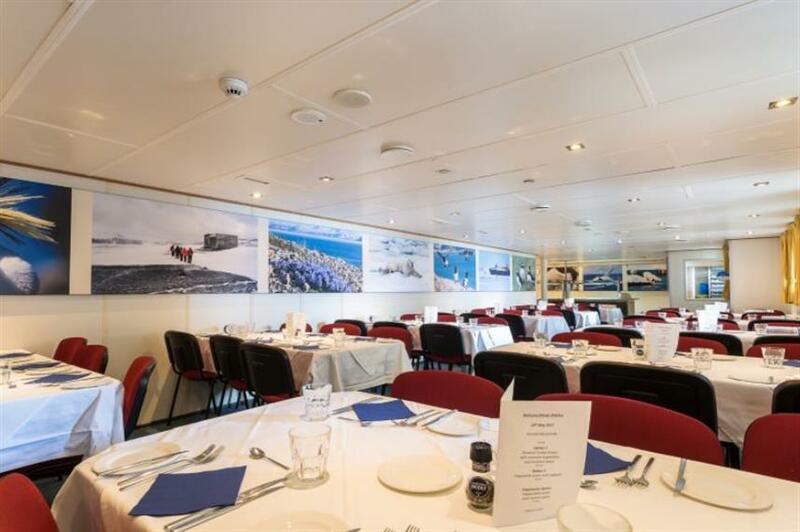 In Spitsbergen there is also the chance to dive with sealions. 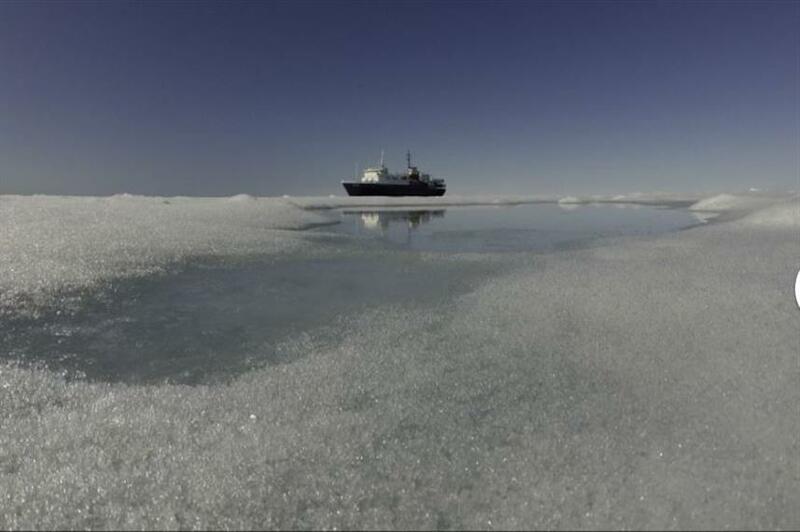 The aim is for 1 - 2 dives per day (1 morning & 1 afternoon), but this depends on local ice and weather conditions. 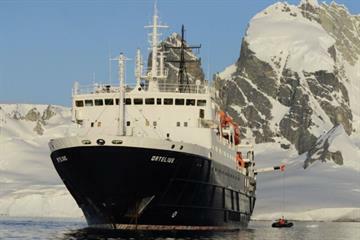 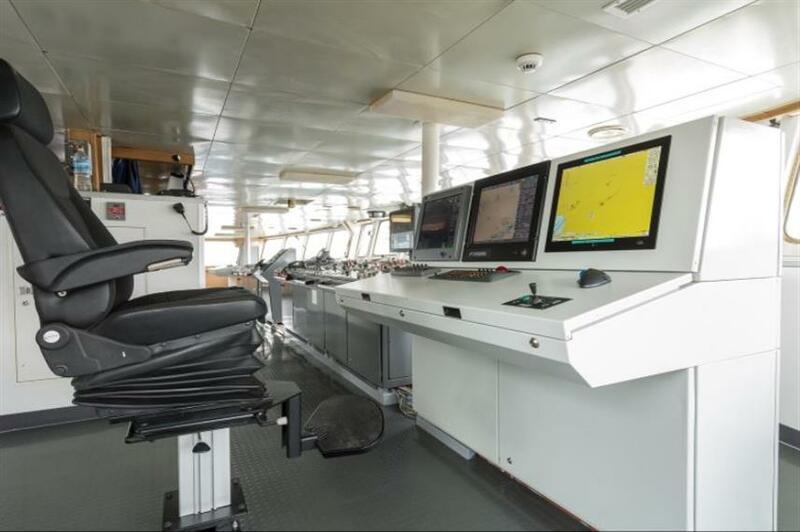 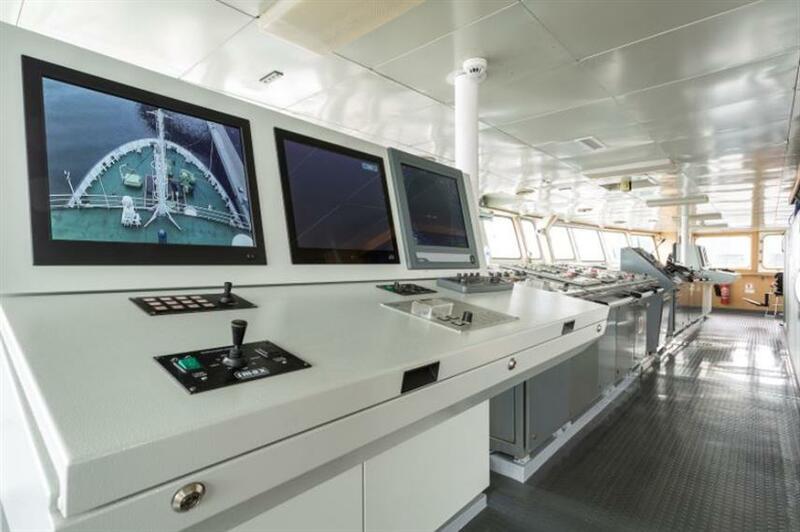 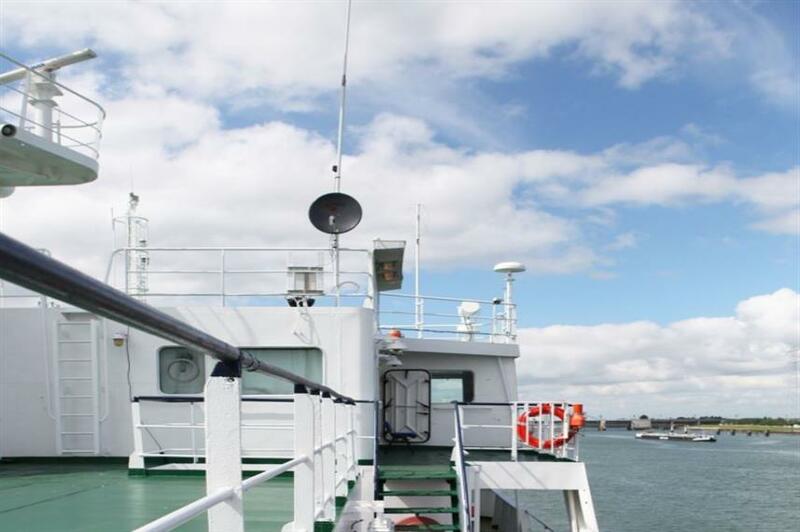 The Ortelius liveaboard takes 116 passengers, but dive groups are kept to a maximum of 24. 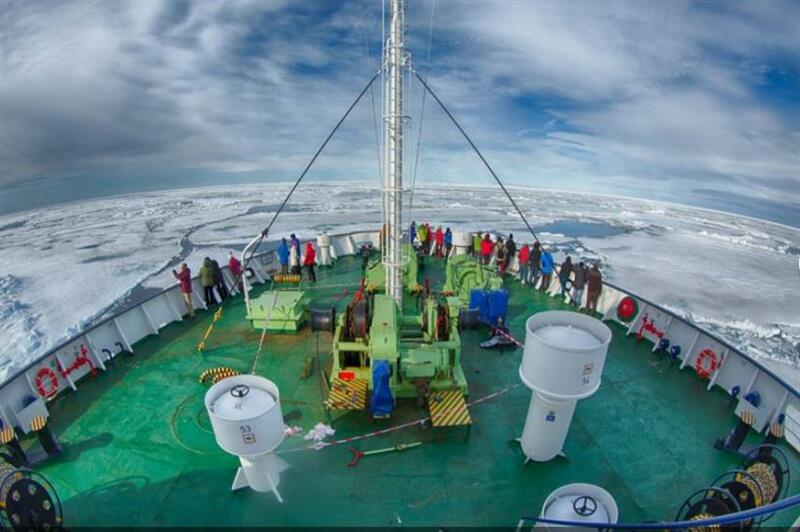 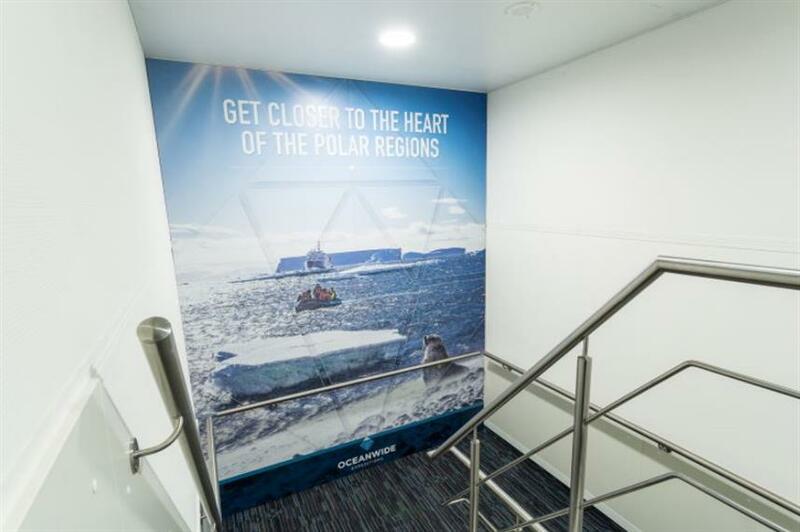 Book your amazing trip to the Arctic today by calling us now or booking online. 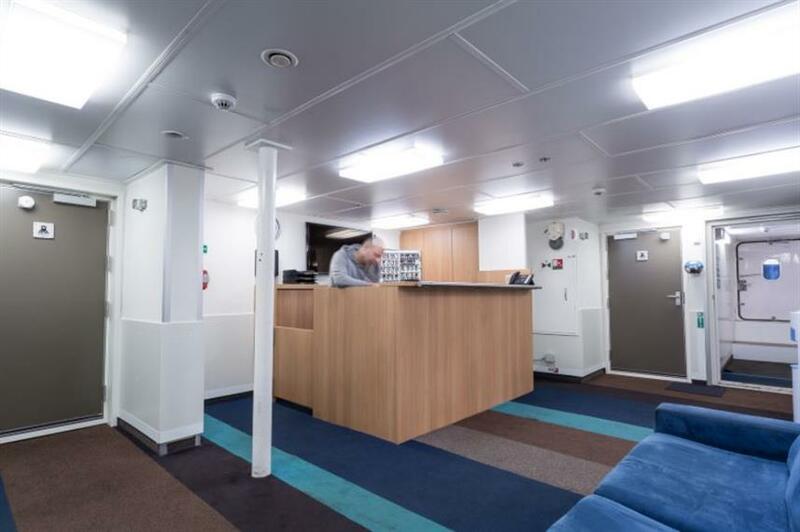 Included: VAT, Port Fees, Airport Transfer, Hotel Transfer, Drinking Water, Tea & Coffee, Welcome Cocktails, Full-Board Meal Plan (All meals), Snacks, Land Excursions, Naturalist Guide, Cabin Towels, Complimentary Toiletries, Laundry / Pressing Services. 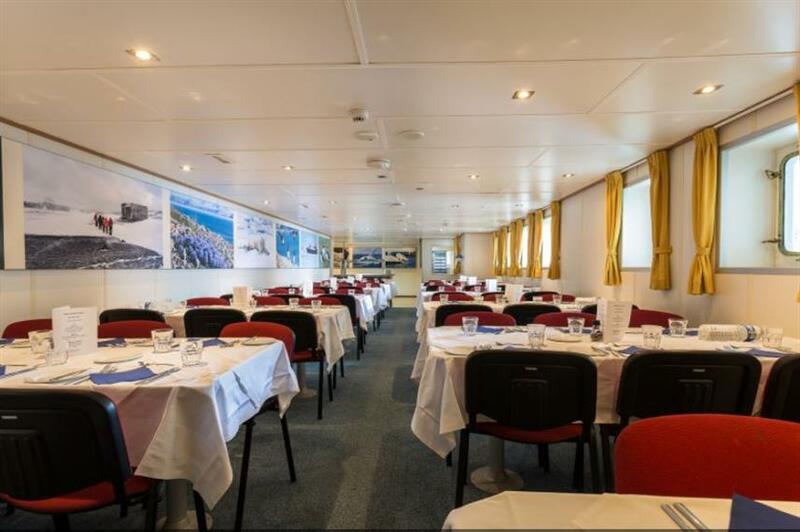 Optional Extras: Travel Insurance, Gratuities, Local Flights, Alcoholic Beverages, Soft drinks, Diving Package, Extra Dives, Nitrox Course, Rental Gear, Scuba Diving Courses, Kayaks, WiFi internet.